The investors and economies of the European Union are in the doldrums. Of the major economic powers, France teeters on the brink of recession and Italy already has entered one. Germany’s economy, the normal engine for growth in Europe has now stalled. Spain is sputtering and the United Kingdom although growing, is heading into headwinds that will make growth difficult in 2015. 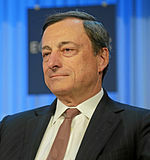 The ECB (European Central Bank) has taken interest rates to as low as they can go. At 0.05%, there is not much more that can be done on that front. The overnight rate that banks are charged for depositing their money with the central bank, is already in negative territory. The next logical step for the policy makers at the ECB would be quantitative easing (buying government debt) in the secondary markets. Germany has long resisted this step because of two major reasons. One is that it lets national governments off the hook, when it comes to difficult although much needed economic reforms. There are powerful domestic constituencies that have created roadblocks in numerous countries, on their way to reform. The second concern for the German government, is that it exposes the German taxpayer to the risk of bailing out their neighboring countries, who refuse to bring down domestic government spending and debt. Although the German government under Angela Merkel claims they are protecting the German taxpayer, many Germans are unaware how exposed they are already to underwriting programs that have prevented default. This has been most notable in Greece, but in Portugal, Ireland and Spain as well. To be fair to Chancellor Merkel, she had little choice. It was either negotiated financial settlements,or allow the Euro-zone to be destroyed beyond repair. Although Germans will complain about being the milk cow of Europe, the Union gives tremendous advantages to German industry and manufactures. It basically guarantees open markets to German goods. The EEC (European Economic Community) allows the Germans unfettered access to the domestic markets of all member nations. 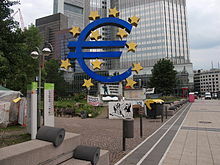 Political leaders throughout Europe are quite aware of the benefits the Euro-zone bring to the German economy. The arrangement prevents them from protecting their own industries, during times of economic downturns. In addition, it prevents them from engaging in the standard practice of devaluation, to make their exports more competitive. On the other hand, it also allows them a form of blackmail, that is to say help us or we will default. The policy of quantitative easing (QE) has actually already arrived. It is just somewhat more limited in its scope. Of course, the New Year will bring an expansion more in line what has been done in Japan and the United States. The ECB is already preparing the way, by making public and private announcements that hint that there will be more easing of monetary policy soon. The ECB has already put in place in additional to the exceptionally low interest rates, long term loans to banks and purchases of some private sector bonds. This week ECB Vice President Vitor Constancio stated, that the Central Bank is ready to start purchasing government bonds early next year, if it decides that more aggressive stimulus methods have become necessary. 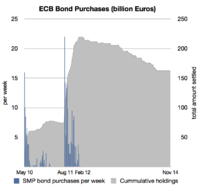 The balance sheet of the ECB is expected to return to what it was in 2012. That would be $1.24 trillion USD (United States Dollar) or 1 trillion Euros higher than what it is at present. The hope is that a first round might be enough to depress interest rates further and stimulate the economy. This is after two business quarters of near zero growth. Without growth in Germany, the EEC as a whole will be in the negative territory for the end of 2014 and going into 2015. The policy of quantitative easing has been off limits since the years of crisis, starting in 2008. This was mainly because the Germans continued to insist that QE will lead to runaway deficits in individual countries and inflation throughout the Euro-zone. Recently there has been greater concern about deflation. If the spiral of ever lowering prices takes hold, it will complicate the previous arrangements that have been made concerning sovereign debt. It makes it much more difficult for nations like Italy and Greece to service their massive debt accumulations, that well exceed their GDP (Gross Domestic Product). For the rest 2014, anxious investors and financiers will have to be mollified with the latest round of measures being initiated by the European Union (EU). These would include providing $26 billion USD,(21 billion Euros) in guarantees for new loans, that will be directed to fund investments in infrastructure as well as medium and small-sized businesses. 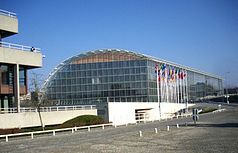 The guarantees will allow the European Investment Bank to partner with private sector investors. It will allow further investments, in long term projects in energy grids and broadband networks. The hope is that such endeavors will attract more private and institutional investors, as they both seek higher returns than are being offered on government bonds. Those yields already at record lows, will dip even further if the ECB begins purchases in the sector. Many analysts still think that these smaller measures, will be insufficient to turn things around in Europe. With national budget restraints in place, that is that deficit spending should not exceed 3% of GDP, it is unlikely that new money can be found to fully exploit such infrastructure undertakings. In fact, many countries will be forced into even more austerity, to meet the rules that have been put in place to deal with long term sovereign debt. Although some nations for example France, are already resisting in meeting deadlines to accomplish this goal, mostly for political reasons. On December 4th decisions will be made how soon the ECB will begin quantitative easing. If it was up to Mario Draghi the ECB President, this would have been initiated months ago. By now the belief is, the Euro would have been devalued and exports would of already begun a rebound. What bolsters the ECB position to begin an easing of monetary policy is that inflation has now dropped to 0.04%, well below the 2% target. Inflation is likely to drop even further, with global commodity prices heading down. Unemployment throughout the Euro-zone remains stubbornly high at an average of 11.5%. The only real growth that is occurring, is on the peripheral areas of the EEC. These would include smaller nations as widely diverse as the Baltic Republics, Ireland, Portugal, Greece and Eastern Europe particularly Poland. However there are still voices coming from the Germans, the Dutch and the Scandinavians about the legality and moral hazards of starting a massive program of quantitative easing. At present, there are rules in place that prevent the ECB from funding domestic governments through purchases of sovereign debt. Austerity it is argued by the traditionalists has worked. They point to the fact that Greece now has a surplus in it’s primary national budget. That is if you take out the interest payments on the national debt, Greece has balanced it’s budget. Yields on sovereign debt have been dropping, precisely because of more prudent fiscal policies put in place. An example would be Spain, where yields on government debt bonds have now dropped below 2%. The opposing sides have not yet reached a consensus. Another quarter of dismal to next to nothing growth, and even lower inflation will tip the balance in 2015. Either in the first or second business quarter, the political and economic forces, will finally force the hand of the traditionalists. They will involuntarily concede that further action is required, to jump start the moribund European economy. ← Next Post $20,000 Open Live Trade & Swiss Votes No On Gold!